Gator-Jaw™ soft shackles are made from Plasma® rope which is the highest strength synthetic rope available. These rope shackles are stronger than comparable steel shackles. Gator-Jaw™ shackles won’t rust and are so light they float. Towing applications include: 4x4 off-road, agriculture & mining equipment and various marine uses. Stronger than steel - 32,000 lb - 14,500kg breaking strength! 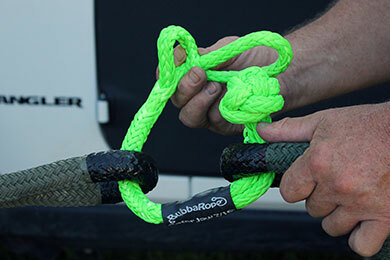 The Gator-Jaw shackle by Bubba Rope can be washed off with water and air dried. While Gator-Jaw fibers are stronger than steel they are susceptible to wear and cutting. Always inspect shackle before use for excess wear, cutting, or worn and frayed areas.